Full Throttle Remastered, the third game in our series of remastered Tim Schafer classics from the LucasArts days, hits the AppStore today! It’s that time of year once more, where three infamous Es come together to celebrate their unity. The Electronics Entertainment Expo is underway here in Los Angeles, and if you look carefully enough you might just spot a few Double Fine folks talking about video games. Here are all the live stream appearances we have planned, where you’ll be able to learn more about about the various games we are publishing this and next year. All the times are PST! Facebook Live, Twitch, YouTube and Mixer.com. Psychonauts 2 Fig update #4! The latest Psychonauts 2 project update is live! In it we detail moving from pre-production to full production and what exactly that means, plus a deep dive on Raz’s new outfit, which you can see all up-close-and-personal-like below! Head on over to Fig to read more! 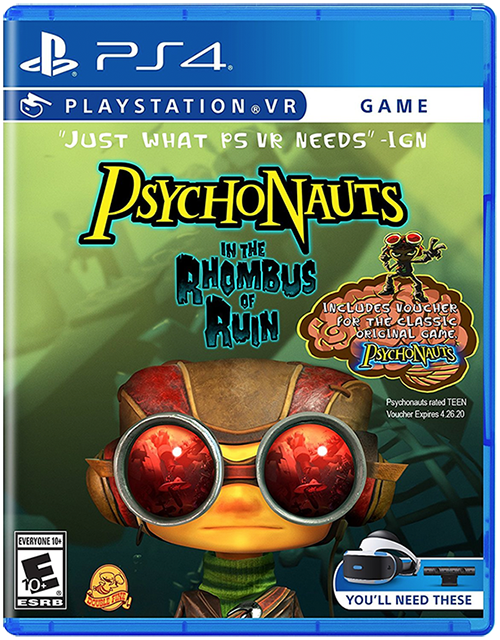 Psychonauts in the Rhombus of Ruin is getting a touchy-feely Physical Release, primed and ready for a spot in your prized game collection. It’s out today in Gamestop, and will be out Monday on Amazon, but you can pre order now! As a rather lovely bonus, the game also comes bundled with a code for the original Psychonauts! 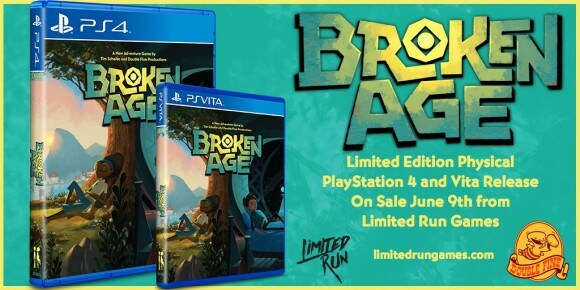 Broken Age is getting a splendid physical release for PS4 and PS Vita courtesy of Limited Run Games! As their name suggests, these editions are very limited in number, and will be available from June 9th for $29.99. Head on over to their website for more info! For the uninitiated, Amnesia Fortnight is an internal game jam in which the Double Fine development teams drop what they’re doing and work on prototypes for new games. It was originally designed as a break away from traditionally long development cycles to make something different for a while, but in later years provided prototypes for games such as Costume Quest, Hack n’ Slash and Stacking. Two projects will be chosen by you, one by the folks here at Double Fine, and one by Tim. The video above gives you a quick glance at all the potential projects, but to see them all you’ll need to head on over to Humble and check them all out! To vote you’ll need to spend at least $1, but sending more unlocks extra bonus content. This year we will also be supporting Special Effect, a UK based charity that helps people with disabilities to enjoy video games. This year the Double Fine Action Forums community will be jamming alongside us, and we’ll be mentoring them along the way. They’ve put together their own pitch videos, and you can vote for their project on our forums, where you will also be able to sign up and join in the fun yourself. Join us and make some games! The third classic LucasArts adventure title to get the remastering treatment from us here at Double Fine is Full Throttle, and it’s headed to PS4, PS Vita and PC on 4/18! The next release from our Double Fine Presents label will be Everything from David OReilly, heading to PS4 next week! Everything is a simulation of reality where everything you see is a thing you can be, from animals to planets to galaxies and beyond — you can be the Universe or create your own. Everything takes place in the world we live in now. It features one million+ years of gameplay, a rich musical score, and thousands of playable characters. It was created by David OReilly who also created one of the first Double Fine Presents titles - Mountain. It is narrated by the late great British philosopher Alan Watts. To get a sense of the game we invite you to enjoy this 10 minute gameplay film that was selected for the Berlin and San Francisco Film Festivals this year. Pre order Everything today! If you are a PS+ subscriber you’ll get a nifty 20% discount, woohoo!